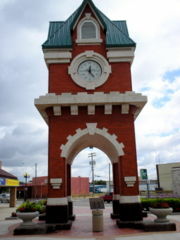 Steinbach is a city of approximately 10,500 people (2004), a short distance from the capital Winnipeg. It is one of the fastest-growing cities in Manitoba, with a population growth of 8.8% between the last two census periods. The city was founded in 1874 by German-speaking Mennonite settlers from Russia. The Mennonite Heritage Village museum, located in the city, provides a glimpse at the life of these settlers through a reconstructed village and interpretive displays. Its Dutch windmill, which was rebuilt after the 1972 replica was destroyed by arson in 2001, is a recognized symbol of the city. Persons of Mennonite descent continue to form a majority in Steinbach, although immigration to the area is rapidly increasing. In 2003 Steinbach residents narrowly voted in a local referendum to end liquor prohibition. Steinbach made the news again in 2004 when it was satirized under an alternate name in Miriam Toews' best-selling novel A Complicated Kindness. As the economic centre of Southeastern Manitoba, service/retail industries employ the majority of the working population. Large manufacturing plants, especially those operated by Biovail and Loewen Windows (which is also based in Steinbach) also create a significant number of jobs. Steinbach is also known as "The Automobile City" for its many car dealerships. Agriculture, the traditional industry in the region, continues to dominate the economy as well. Steinbach has a retail trading area of about 50,000 and recently Superstore opened a 110,000 plus square foot store. For the business owner, Steinbach boasts a large consumer base enjoying the benefits of a strong local economy. Because of the City's continuing and rapid growth, merchants are able to tap into a number of different consumer groups. As well, Steinbach is surrounded by a number of diverse and successful communities - people who enjoy country living, but take advantage of the City's shops and services. The population of Steinbach and the surrounding area is an ideal mix for rapid, but long-term, economic growth.